Day five of the second Daily Marker 30 day colouring challenge. I had an idea for a birthday card for someone that would use one of the birthday blueprint stamps, but I also needed a mini robot and it didn’t arrive in today’s post, so I used the other blueprint stamps to create a pair of cards. I watercoloured the cupcake and present images with Distress ink and, once they were dry, fussy cut them out and added Wink of Stella to the ribbon and the cake frosting and a drop of Glossy Accents to the candle flame. I chose patterned paper to match the main colours of the images and cut it and the buckram to size. 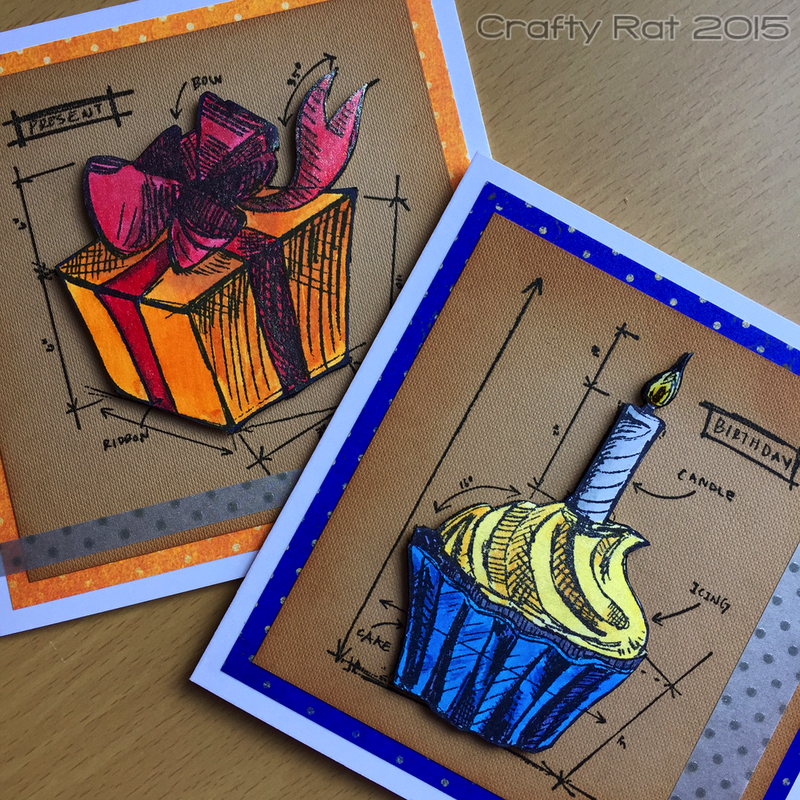 I stamped the present and cupcake images again on the buckram and used the mini ink blending tool colour the edges. I glued two layered panels to each of the card bases and then mounted the fussy-cut images over the stamped images on the card bases using foam pads. Finally I added a strip of the spotted vellum as an accent. No matter how careful you are there is a good chance that Wink of Stella will dump a large blob of shiny on your work.